Anyone else watch the Olympics and feel suddenly inspired? I know I do. Although, I have to admit that sometimes I end up feeling slightly sad and reminiscent of my skiing and snowboarding days. It makes me miss the days of when I was still able to tear down the mountain side. Alas, those days are long gone, thanks to multiple repeated head injuries due to various snowboarding accidents and childhood concussions. Despite all that, I still enjoy watching other people succeed, whether they win a medal or not. It's just inspiring knowing how hard those athletes have had to work to get to where they are. If only the whole world had that sort of ambition and self-motivation working towards love and respect. This world would certainly be a happier place. Since it's Monday, and the day is foggy and wet (more like April than February! 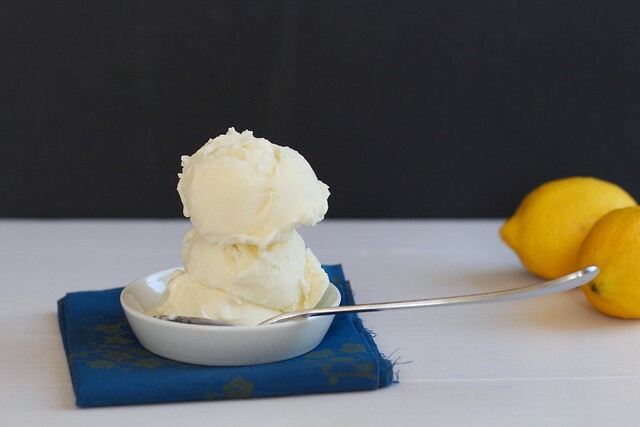 ), I thought it was a good time to share some delicious lemon ice cream. Also, February break just ended, so ice cream is definitely in order. This isn't just any ordinary ice cream either. Okay, well maybe it is, but the taste and texture is superb and unparalleled to any other lemon ice cream I've ever tried. It's rich, but not overly, it's perfectly creamy with a slight tang of lemon, but not so much that your face puckers up and your eyes squint because it's so sour. 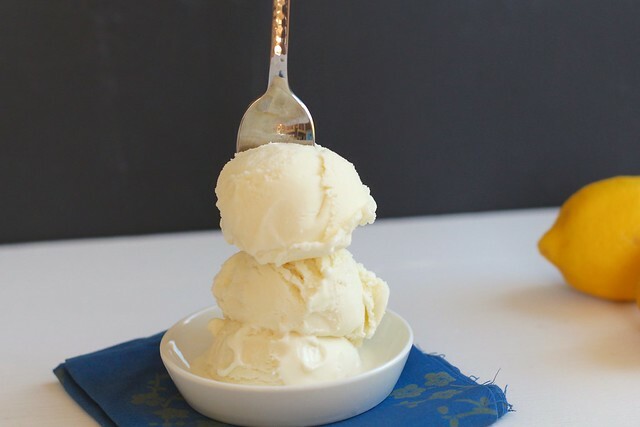 I think this ice cream would be particularly good with the marmalade I made last week. Or with some fresh fruit on top. Or just by itself, because, really, it doesn't need anything else to make it delish. Despite it still being winter, at least for us in the northeast, ice cream is always acceptable. This is a great treat to remind you that spring is on its' way and perhaps transport your brain, if not your soul, to a warm, happy location. Make it, eat it, and let me know what you think! Happy Monday! 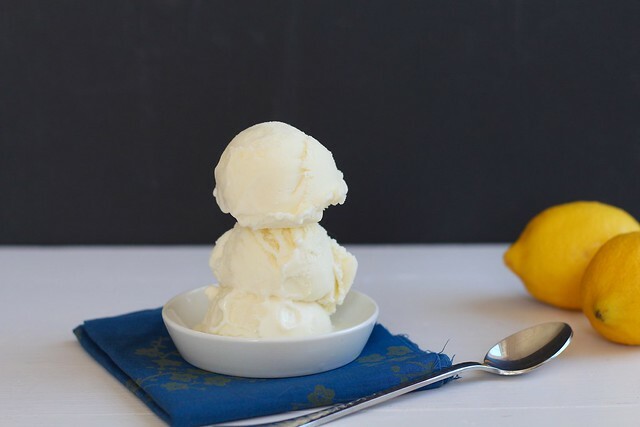 To make the lemon syrup, peel the zest from 2 of the lemons using a vegetable peeler to make big strips, place in a small bowl and set aside for the ice cream base. Halve the lemons and squeeze the juice from them to make 1/2 cup, using the third lemon if necessary. Combine the lemon juice and 2 tablespoons sugar in a small saucepan and bring to a boil over medium heat, stirring until the sugar is dissolved. Remove from the heat and let cool completely (you can refrigerate the syrup to speed the cooling process). To make the ice cream, whisk two tablespoons of milk with the cornstarch in a small bowl to create a slurry. In a separate, medium mixing bowl, whisk the cream cheese and salt together until smooth. In a medium saucepan, combine the remaining milk, heavy cream, sugar, corn syrup and reserved lemon zest strips over medium-high heat. Bring to a rolling boil, and let boil for 4 minutes. Then, whisk in the cornstarch slurry. Bring the mixture back to a boil and stir with a rubber spatula until slightly thickened, about 1 minute. Carefully pour the hot milk mixture into the bowl with the cream cheese, whisking while you pour. Whisk until smooth. Cover the bowl and refrigerate overnight, or place the bowl in an ice bath to speed the chilling process. When you are ready to churn the ice cream, remove the lemon zest strips. Pour the ice cream base into the canister of your ice cream maker and turn on the machine. Then, pour the lemon syrup into the ice cream. Freeze the ice cream according to your manufacturer's directions. Store the ice cream in an airtight container in the freezer.